All rolled up together…small balls of fur cuddled up like an entity, with closed eyes, they look like angelic beauties. Yes! We are talking about a pack of new born pups. To preserve these gifts of God, we have to be extra careful about their upbringing, especially for the first eight weeks, which has a strong influence on their personality and development. Here’s how to bring up the smartest, healthiest and most disciplined pooch. When a pup is born, his first socialization starts with his mom and it’s the strongest bond… Puppy’s relationship with his mother and siblings during the first eight weeks is most important as it plays a vital role in his development and his attributes, in later life. The first test of life starts with his littermates only, where the smartest one of the pack gets maximum nourishment and mother care. Nature has given an instinct in everyone that helps him survive. In the first two weeks, newborn puppies spend more than 90 percent of their time sleeping… They are unable to produce body heat, so doggy mom just keeps them huddled together for warmth. Their natural instincts guide them to reach their mom for feed and heat. But their legs are so weak that they cannot even crawl, so if mother allows, caretaker or breeder can help puppy in getting nourished. Mother’s milk is important as it is a rich source of antibodies, which helps them grow stronger. 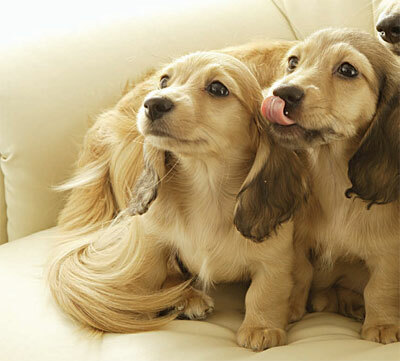 Mom takes good care of pups in everyway; she licks and cleans the pups and also cleans pup’s anogenital area, which helps them urinate and defecate. At this stage, a pup’s senses become fully active, he can see, smell and feel. He will react to light and respond to loud noises as well… better check yourself, just ring the bell…. or try a torchlight…he will react in an adoring way. He even starts pawing his littermates and moves a little also. Even though he has started relieving himself, he still needs to be cared. He should not be weaned, but we can start giving some supplements to him. And you will also notice the first wag of your pup at this stage…all tails up! In these two weeks, one will notice the maximum and fastest growth of li’l puppies… they start crawling, walking and even running. They start playing with the littermates and this is the time doggy mom becomes the strict guide, she teaches discipline and set limits for each pup…and this is every pup’s first lesson to behave. The pups now bark and make themselves audible for their needs and requirements. It is the best time to start socializing with them. They will develop acquaintance with the surroundings and mix well with the human companions as well, besides littermates and other things. The pups also start having first teeth at this stage. Start giving them soft food to chew, the caretaker or the children in house should take this opportunity to start feeding them to develop a long human-canine bonding with them. The mamma’s little boy starts looking more like his breed, his muzzle elongates. The expressions become clearer, he barks in defense, whimpers in fear, and wags in excitement. He will start demanding pat and pampering…in a typical pooches’ way. Now they can eat solid food as well, so start dog food, as mother for sure, will wean them at this stage. The urge to explore newer horizons increases rapidly by the end of this stage; he will sniff for new places and things…always on a lookout for something new. This is the stage, he is fully aware of his behaviour and knows when to feed, roam, urinate or defecate. He gets used to human intervention in grooming, feeding, and playing etc. During this period, the war of supremacy reaches a newer level, you will observe strong behavioural changes and reactions. At this time, he is ready to leave his littermates and find a new loving family for himself. Are the pet lovers listening ? Thyroid problems – canines get affected too!